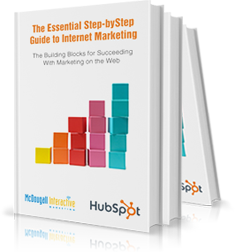 Download the Essential Step-by-Step Guide to Internet Marketing! Isn't it time for your business to profit from the latest online marketing tactics? We've compiled them for you into a brand new free ebook that's already been downloaded more than 74,000 times. The newest and hottest Internet marketing tips, tricks, and techniques are right here, whether you're just jumping into online marketing or you want to take your strategy to the next level. With just one download, you get access to the knowledge you need to set up and implement an epic Internet marketing plan, in-house, starting right now. This comprehensive guide covers the 9 essential steps guaranteed to bring you online marketing success – plus much more! Whatever your industry, whatever your online experience, one download is all you need to effectively market your business on the web and crush the competition. It's free, and it's waiting! Learn the newest and hottest Internet marketing tips, tricks, and techniques right here.